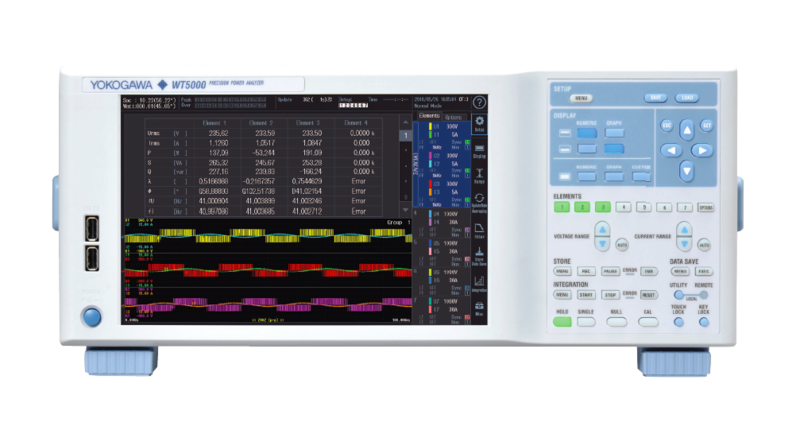 Yokogawa Test & Measurement Corporation announces that it has developed the WT5000 precision power analyzer and will release it on October 11. This new product accommodates up to seven input elements and has a world-class measurement accuracy of ±0.03%. The WT5000 succeeds the WT3000E, a Yokogawa flagship product that has sold strongly since its release in 2015 thanks to its superior measurement accuracy. With the WT5000, Yokogawa aims to expand its business in the power measurement field and build a sustainable society by helping its customers improve the efficiency of their electric vehicles (EVs) and renewable energy products. There are many global issues that need to be addressed to achieve a sustainable society, and almost all nations recognize the need to do this. Initiatives on this front include the adoption of the Paris Agreement at the 2015 United Nations Climate Change Conference (COP21) and the UN General Assembly’s announcement of sustainable development goals (SDGs) to be achieved by the year 2030. Accordingly, industry is speeding up the development of EVs, plug-in hybrid (electric) vehicles (PHVs/PHEVs), fuel-cell vehicles, solar and wind power generators, and energy-saving home appliances. To make these products more energy efficient and help them operate more efficiently, it is essential to be able to precisely measure the slightest improvements in efficiency. Global demand is thus rising for highly precise power analyzers that can precisely measure power consumption and assess energy efficiency. In response to such needs, Yokogawa has improved the performance and functions of its flagship power analyzer by adding new functions, and is releasing this new product as the WT5000. With reference to the WT3000E, the measurement accuracy of the WT5000 has been improved from ±0.04% to ±0.03% at AC 50/60 Hz, DC power measurement accuracy has been improved from ±0.15% to ±0.07%, and the low power factor error has been decreased from ±0.03% to ±0.02%. With these improvements, power consumption, power loss, and conversion efficiency can be assessed more precisely, satisfying our customers’ need for a solution that can help them develop products that consume less power and are more energy efficient. To meet the need for a power analyzer that is capable of efficiently performing the ever increasing number of measurements required for the development of power conditioners and other devices used in EVs, PHVs/PHEVs, fuel-cell vehicles, and solar and wind power generators, Yokogawa has increased to seven the number of input elements that can be mounted on the WT5000. The WT3000E accommodates four elements. The WT5000 input elements are in modular design and can be easily swapped in and out by the customer. With this feature, it is no longer necessary to send the unit back to the factory for modifications to change the number of inputs, at considerable savings in time and cost. Despite all these enhancements, the WT5000 still has nearly the same dimensions as the WT3000E, and is thus appropriate for use in locations where space is at a premium. An optional function supports the simultaneous measurement of speed and torque for up to four motors. This is ideal for applications involving EV in-wheel motors and four-wheel drive vehicles. As a pioneer in this field, Yokogawa started the development and sales of electronic power analyzers in 1970. The company now holds a leading position in the high precision power analyzer market (as of September 2018, based on a Yokogawa survey). Through the provision of power consumption and energy efficiency measurement solutions, Yokogawa helps its customers develop energy efficient products and reduce power consumption at their production sites.